63C has one of the largest screened porches in Bermuda Bay. It sits just a few steps across the grass from the beach, and you can enjoy the water view from the living room sofa, or the double reclining swing on the large screened porch. You can park right at the front door, and being on ground level, you can grab your shelling bag, fishing rod, or beach towel, and walk right out onto the grass from the porch. We have recently upgraded the bathroom with a washer/dryer combo. We also just installed a new 40" LED flat screen TV in the LR. For our guests enjoyment, we provide little extras like a small library, some games, jigsaw puzzles, a few video movies, etc. There is even a gas grill on an outside patio, and extra chairs and loungers for our guests to use outside. You will enjoy the lovely grounds, and the beach pool recreation area by the Clubhousewith its Jacuzzi and sun decks. There is also a 2nd large heated pool by the racquet ball and tennis courts in the pretty wooded area east of the waterfront in this complex. Bring your fishing rod and wade off our beach to try the excellent fishing St. Pete is known for; or enjoy the boats and water activities, manatees, dolphins and exotic sea birds from the comfort of your porch swing. If you like to hike or bike, we provide our guests a key to the side gate leading to the trails of Clam Bayou, a wildlife preserve next door to Bermuda Bay. Although you may never want to leave this "hidden jewel" amidst the famous Gulf beaches of St. Pete and Ft. Desoto, the surrounding area offers a lot of fun adventures to explore. Nearby you can rent a variety of boats, go deep sea fishing, parasailing, snorkeling, bicycling, rollerblading and more. There is also a variety of sightseeing, dinner or gambling cruises available. Besides the famous public Gulf Beaches and wonderful parks like the nationally acclaimed Fort De Soto Park with all its activities, we are also close to many golf courses, marinas, shopping centers, great restaurants, and all the major sports stadiums. The artists Mecca of Gulf Port is just around the corner. Museums, downtown St. Pete, and the Pier are 10 minutes away via I-275; Tampa International Airport is 20 minutes away; Busch Gardens is 30-minute away; and Orlando's attractions are about 80 minutes away. Our proximity to I-275 makes everything minutes from Bermuda Bay. 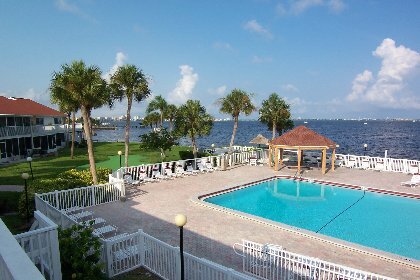 Many guests have found that having their main base on The Gulf Coast is the ideal way to combine a relaxed and peaceful beach holiday, with the excitement of the Tampa Bay and Orlando areas. Amenities: C/H&A, Internet available at extra cost, 2 Phones, Answering machine, Cable TV, Living Room & Bedroom TV's, Clock radio, VCR, Stereo DVD player, Desk, Library, Puzzles and Games, Full kitchen including refrigerator, microwave, dishwasher, toaster, coffee maker, dishes, cookware and utensils, and Linens. Private Beach, 2 Heated Pools, Jacuzzi, 2 Lighted Tennis Courts, Racquetball Court, Playground, Putting Green, Club House, Picnic Area, Park Benches, Beach Tiki Huts, 2 Laundry Facilities and 24-7 Security. View west across heated beachfront pool & Jacuzzi by clubhouse (2nd pool rec area by tennis & racquetball courts on eastside; beautiful Clam Bayou nature preserve for hiking or kayaking to the north). Just a few steps out the back door across the grass to the white sand on our private beach. Join the nightly sunset parties. Deposit: $300 Refundable Security Deposit. Hold booking with $500/mo. non-refundable earnest money deposit to be applied to 1st mo. rent; balance of rent due 60 days prior to arrival.